Torrente is a new online slots machine based around a retired police officer that still fights crime on his own terms! Jose Luis Torrente is the protagonist of a great number of action/comedy movies that are still watched to this day (see the preview below). On the reels, you will find characters from the films, as well as playing card icons that accurately describe our retired detective’s life. The reels are set in a rather morbid location – a cemetery! You see Torrente grinning at you from the sides while you spin this 5-reel, 3-row game with 25 flexible paylines. You will encounter two different special features while playing: The Operation EuroVegas Bonus and the Hotel Paradise free spins. 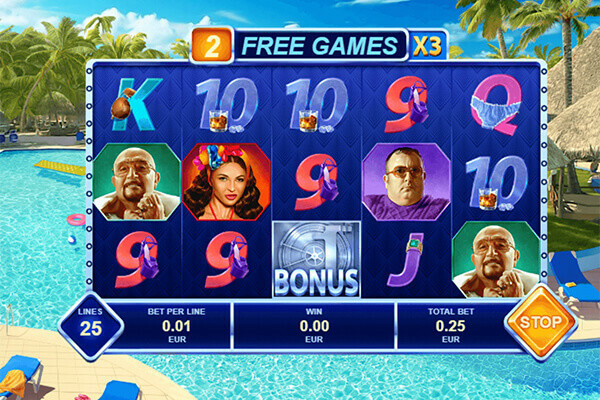 So if you were itching for a dose of Torrente, this new Playtech casino slot has you covered. The last movie was released in 2014, meaning this title is all we have until the next one comes out. It is quite clear the developers went all out to make the best of the movie license. The graphics are top notch, with a detailed background and interesting symbols. When certain icons become part of winning combinations, they play different scenes from the movies. Gameplay is very fast paced, with lots of small, frequent pays lining your pockets. If you enjoy a slightly lower variance, then Torrente will be right up your alley. Players get an RTP of 95.17%, which is a bit bellow the average and far below the top slot machines you can find online. It’s not the worst, but if you check the list of Loosest Playtech slots to see the difference. The special features lack in both variety and creativity. One is a standard free spins bonus with an increased multiplier. The other lets you spin a large bonus wheel, and then pick between six bank vaults for additional cash prizes. These are special features we would expect from a game released in 2012. Playtech can do a lot better. 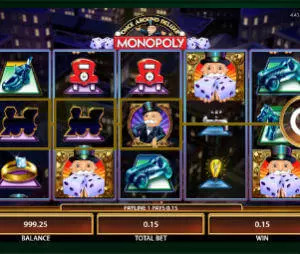 Despite the lower variance, it can be quite difficult to trigger free spins! The Operation EuroVegas fires quite often for us, with admittedly boring results most of the time. We expected free spins to be more lucrative considering their rarity, but the big wins simply never came. While the available bonuses are functional, they are hardly worth getting excited over. Compared to other Playtech releases, the special features are definitely lacking. Collect three Wilds in the second, third and fourth reel at the same time to trigger 15 free spins with a 3x multiplier – similar to the classic Free Spins feature originally brought by Queen of the Nile and Cleopatra slots. It is possible to retrigger this bonus and win more free spins by collecting three Wilds again. It is also possible to activate the Operation Eurovegas special feature while free spins are already being played. Land three or more vault Scatters anywhere on the reels to activate this bonus. First, gamblers spin the large wheel of fortune to get a cash prize. After that, they are let inside the vault, where they can pick up to four out of six items. The special feature can end early if players are unlucky enough to draw the Collect instead of a cash prize. The lower variance, fast-paced gameplay, and superb graphics all speak of a slot made for casual gamblers. It is clear Playtech’s focus was to attract Torrente fans to a game with lower risk, rather than provide a lucrative and fun title for their existing players. With bonuses as bland as they are, we recommend skipping this one unless you are a big fan of the movies.